WASHINGTON — Changes along U.S. Route 1 through Fredericksburg, Virginia could speed up trips for regular users and those diverted off Interstate 95, while also reducing crashes, the Virginia Department of Transportation finds. A study focused on intersections, bottlenecks and safety in the area north of Virginia Route 3 — also known as William Street — and south of the Rappahannock River estimates that around $15 million in projects could reduce the amount of time spent in delays by 34 percent. 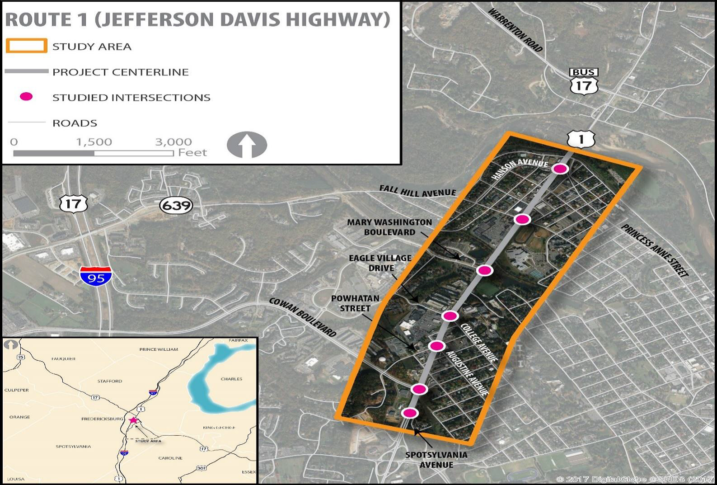 VDOT, the City of Fredericksburg and the Fredericksburg Area Metropolitan Planning Organization are among those involved in the ongoing process to prioritize the proposed projects, none of which is funded at this point. A public meeting on the proposals was held Monday. The changes range from turning some stretches of side streets or service roads into grassy areas instead, to restricting turns and redesigning intersections. The most expensive projects in the mix would overhaul the intersection of Route 1 and Fall Hill Avenue and rework the area from Route 3 to Cowan Boulevard. The Fall Hill Avenue project is the only one that has been submitted for state funding by the City of Fredericksburg. There are no construction dates or firm funding available yet for any of the proposals. “They are recommendations that the City of Fredericksburg or the Fredericksburg Area Metropolitan Planning Organization can advance as funds become available to improve safety and traffic flow on this busy commercial area that also serves as an alternate route to I-95,” VDOT’s Kelly Hannon said in an email. The recommendations focus on alleviating the significant delays during the afternoon and evening rush at Fall Hill Avenue and Cowan Boulevard, as well as the long lines to make left turns at a number of intersections. The larger project from the Route 3 off-ramp to northbound Route 1 up to Cowan Boulevard is also meant to address the issue of drivers weaving through traffic to get across to make a left turn. Between Fall Hill Avenue and Princess Anne Street, the crash rate is more than double the statewide average. At Princess Anne Street and Hanson Avenue, the proposals would extend and raise medians, turn the Freedom Lane cut-through into a park, and add new restrictions on turns among other things. Including new sidewalks meant to add an additional level of safety, the project would be projected to cost $2 million. The changes would be projected to reduce delay by 75 percent and reduce crashes by 57 percent, VDOT said. At Fall Hill Avenue, additional and extended dedicated turn lanes, an extended median to make drivers using Wellford Street only turn right in or right out, and other changes have been recommended. An additional option would be to force drivers on Route 1 trying to make left turns to loop around the block. The project is projected to cost more than $7 million, and could reduce delay by 40 percent and crashes by 31 percent. At Powhatan Street and Augustine Avenue, a recommendation would effectively close the service road west of Route 1 and fill it in with grass, close off a number of driveways and other turns currently made directly from Route 1, and make some turn lane changes. That project would cost about $1 million. At Cowan Boulevard, $1.5 million in additional turn lanes and sidewalks could help reduce delays by 42 percent largely by easing the long wait to make a left turn and reduce crashes by 25 percent. Between Route 3 and Cowan Boulevard, a $4 million project would add a traffic light at the Route 3 off-ramp so that three lanes could go right onto northbound Route 1. Among other changes, a new third lane would be added on Route 1 back to the ramp so that drivers headed to Cowan Boulevard could go directly into a left turn lane. VDOT is accepting public comment on the proposals now.